New York, N.Y. Recently I agreed to co-host the World Peace, Health and Culture Conference at the United Nations on behalf of Orphans International Worldwide (OIWW), which I founded 12 years ago. Peace, health and culture are essential to “raising global citizens,” the motto of our orphan care program. My friend Dr. Noel Brown, founder of the Friends of the United Nations, agreed to assist. Our goal: to award individuals who have excelled in the fields of health and culture. received OIWW’s 2011 Humanitarian Awards at the U.N. Photo: by David Li. One woman to recognize would be Yiling Li, a Chinese-American actor, author and social activist who has been engaged in helping humanity for more than a decade in New York City. Yiling is also a well-known artist, noted movie and TV producer, choreographer and writer. Yiling heads theU.S.-China-Thai International Cultural Development Center (UCT), an organization promoting the arts and international development between the U.S., China and Thailand. And she was only the beginning of the thought leaders and global citizens we ended up honoring. Yi Ling was awarded OIWW’s 2011 Outstanding Artist Award. Hopkins and is a strong supporter of culture and health. Photo: by David Li. We agreed to honor some heavy hitters, first and foremost the Chinese Ambassador to the U.N. who has been a big supporter of culture and health, the Hon. Li Baodong. The ambassador graduated from Johns Hopkins and has been posted around the world. Then we agreed to honor prominent artists from Thailand and China: Li Guodong of Thailand and Wang Linxu of China. Dr. Wang Linxu’s impressionist landscapes hang in museums around the globe and he serves as vice president of Minzu University. Prof. Li Guodong is a world-renowned Chinese calligrapher who resides in Thailand on whom OIWW bestowed its 2011 Humanitarian Award. He is president of the International Institute of Calligraphy and Paintings of Thailand and has been practicing Chinese ink calligraphy for more than 60 years — since he was six years old. he serves as Vice President of Minzu University. Photo: by David Li. There were a total of eight award recipients at the U.N. Conference. Photo: by David Li. 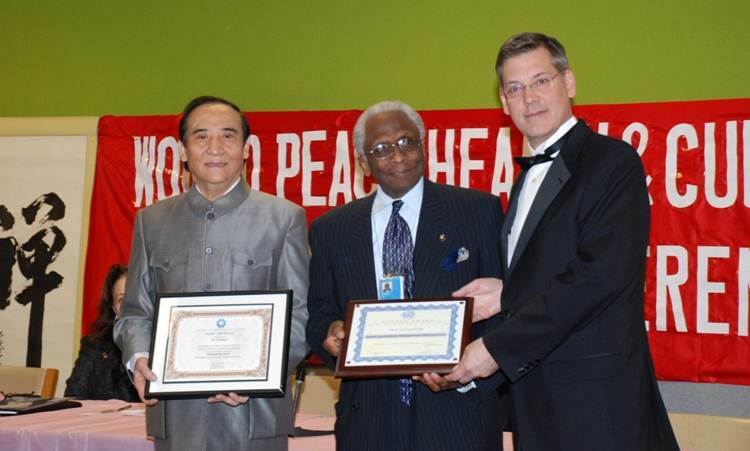 Prof. Wang Linxu was also presented with the OIWW 2010 Humanitarian of the Year Award at the U.N. Dr. Wang is a world acclaimed artist and a member of the National Committee of the Chinese People’s Political Consultative Conference as well as Vice President of the Nationality University of China. 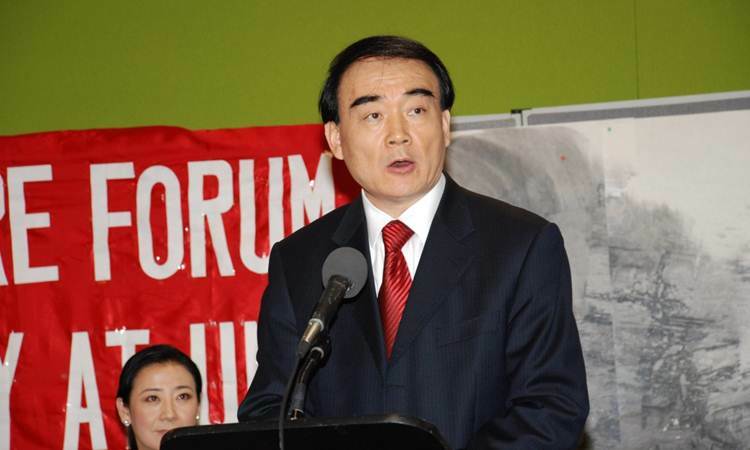 He also serves as an executive member of the U.N. Association of China. In 2011, one of his paintings, The Sky Description, sold at auction for $1.3 million here in New York. Congress participants as well – here to Prof. Li Guodong of Thailand. Photo: by David Li. In recognition of his contribution to world peace, former U.N. Secretary Generals Boutros-Ghali and Kofi Annan, as well as the current S.G. Ban Ki-Moon have all awarded Dr. Wang Linxu the title of United Nations’ Envoy of Peace. 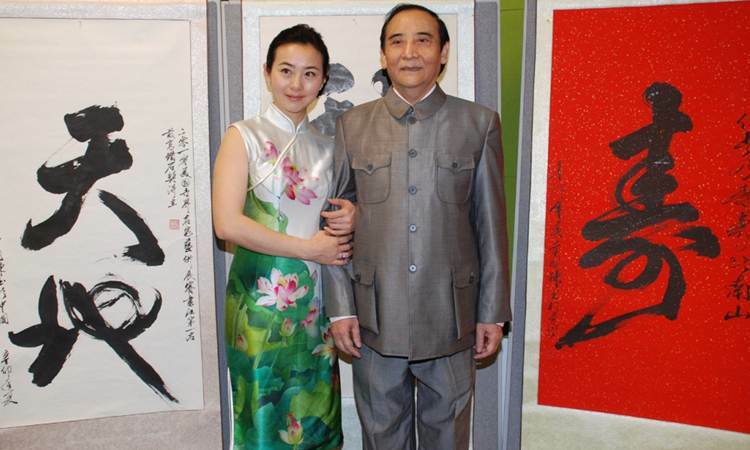 The OIWW 2010 Philanthropist of the Year Award went to someone relatively unknown in the U.S., Wang Yanfeng in Beijing. Mr. Wang founded and serves as chair to the important and generous Chinese Medical Development Foundation. This foundation has worked to improve health standards for all Chinese, including “the common Chinese,” since 2005. Mr. Wang has raised millions of Yuan — over $1 million — for the improvement of health of ordinary citizens of China. The Chinese Ambassador to the U.N., the Hon. Li Baodong, spoke. Photo: by David Li. With “world peace, development, health and culture” as its theme, this conference advocates promotion of world peace and development through good health and a pluralistic culture. Dr. Noel Brown (right) with award recipient Dr. Wang Linxu and myself (left). In recognition of achievements in arts and culture, OIWW presented its 2011 Outstanding Arts Organization Award to the U.S.-China-Thai International Cultural Development Center which was first established in 1995 in Thailand and registered in New York in 1999. UCT ‘s mission is promoting Chinese and Thai arts and culture in the world as well as supporting East-West harmony, understanding through cultural and educational exchanges, and promoting charity for poor children around the world. I was deeply honored by the opportunity to honor others for their leadership roles in helping humanity at the United Nations. Thought leaders and global citizens such as Ambassador Li Baodong and philanthropist Wang Yanfeng in Beijing allow us to move forward towards a common humanity in which we can strive for greater peace, health and enlightenment through culture. Edited by Ferdi Kayhan, Germany. Follow Jim Luce on Facebook.